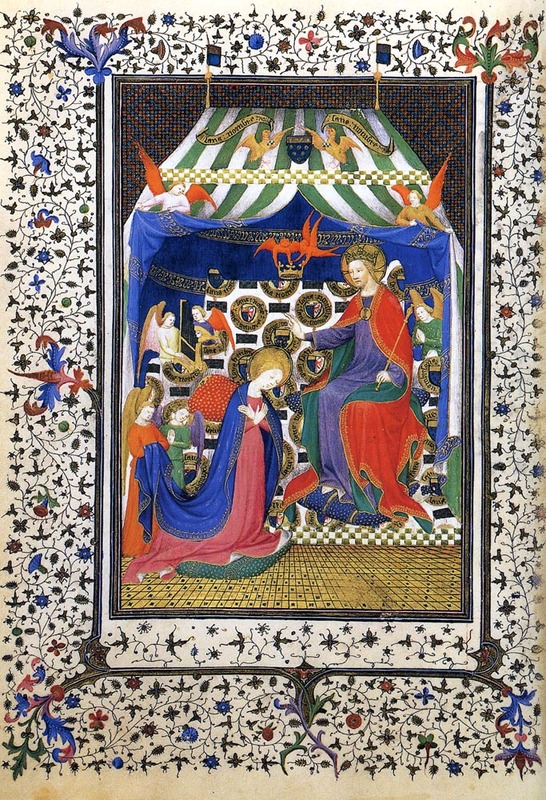 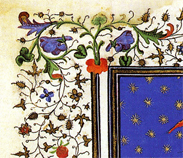 Meiss, 1968, p. 4: Paul Durrieu recognized the Boucicaut Hours as the chef d'oeuvre of a master who was more or less personally responsible for miniatures in a couple of douzen manuscripts. 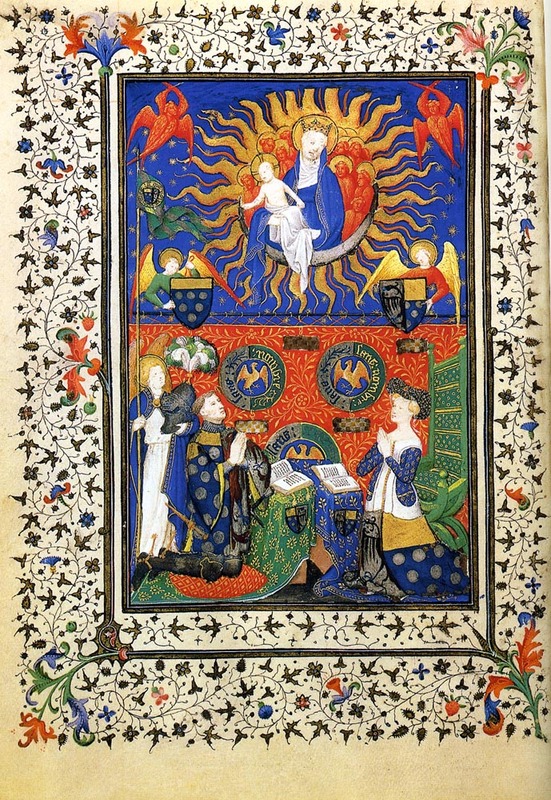 In two fundamental articles in 1906 and 1913 Durrieu reconstructed the workshop of the Boucicaut master with almost unerring jdugment. 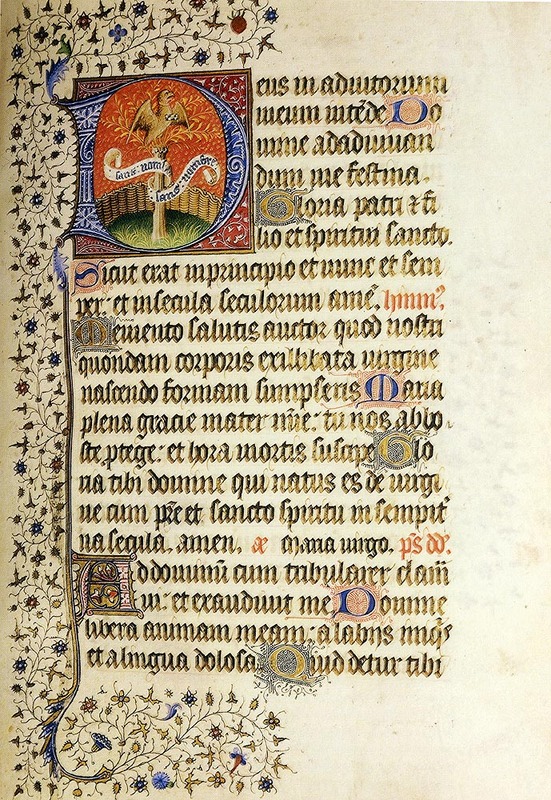 A terminus ante quem for the Boucicaut Hours would be the battle of Agincourt since boucicaut was taken as a prisoner to England and died there in 1421. 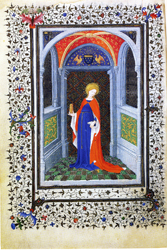 He was involved with Genoa from 1401 until 1408? 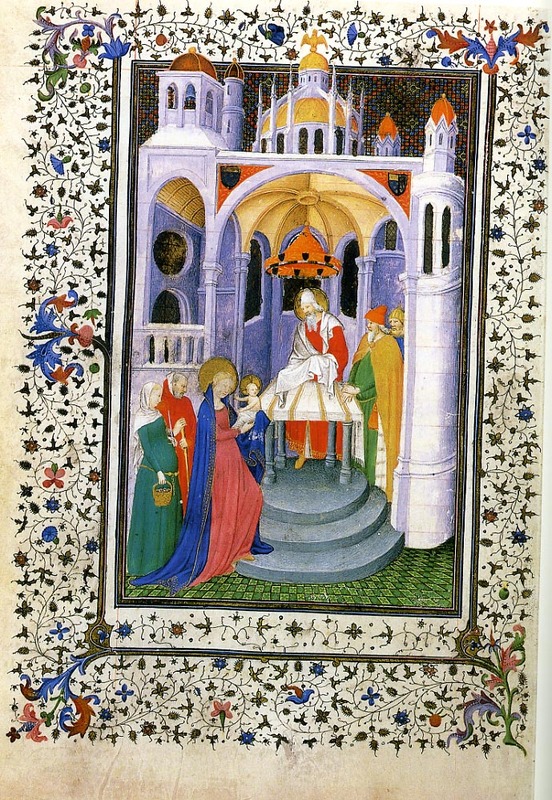 when the people of Genoa rose up against him and he withdrew to the Piedmont. 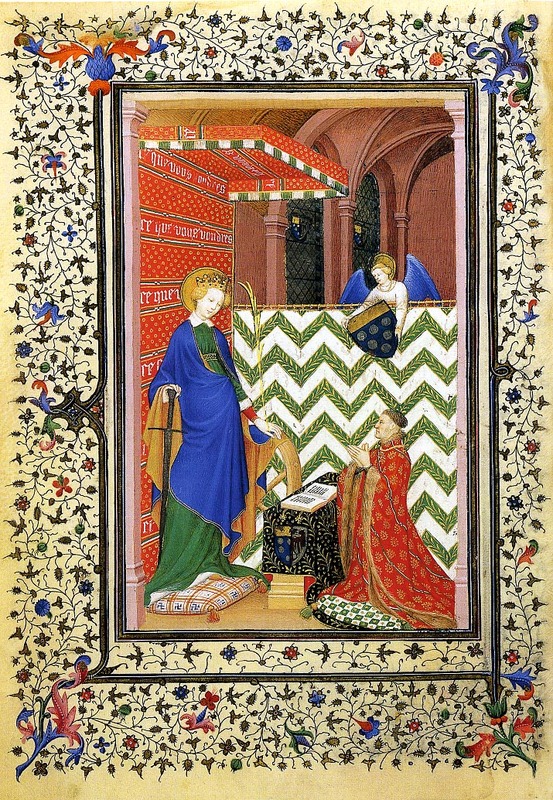 From then until Agincourt he served as the Governor of Guyenne and Languedoc. 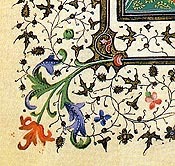 Meiss, p. 10 and fn 30 mentions speculation about dating. 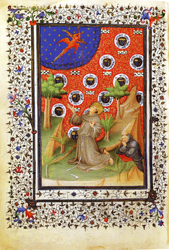 "Hitherto opinion about date has favored either the period 1410-15 or a couple of years within the first decade, or successive campaigns from 1400 to 1410-1411. " 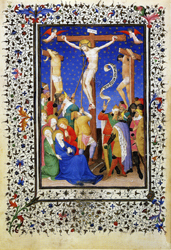 Meiss, 1968, p. 11: Three exceptional attributes and emblems all point to the identification, and we must therefore accept the probability taht the illumination of the Boucicaut Hours was completed after the assassination of Louis d'Orleans on November 23, 1407. 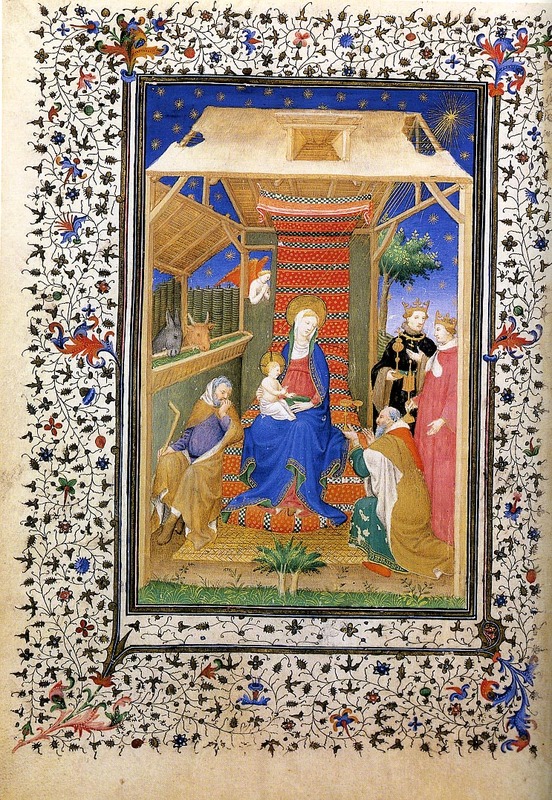 The part of the manuscript that precedes the Adoration of the Magi, which contains no evident reference to the prince, could well have been painted earlier. 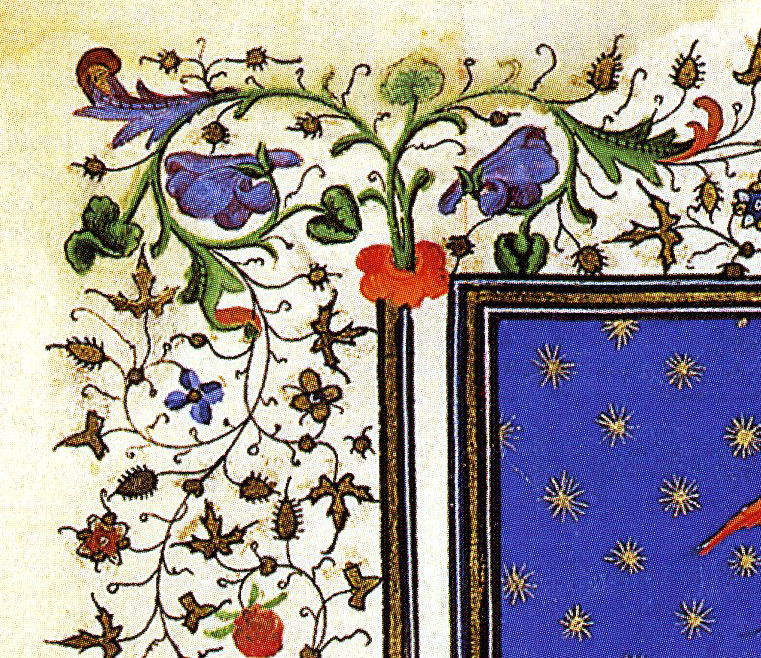 These historical indications correspond well enough -- but not perfectly-- with those provided by style. 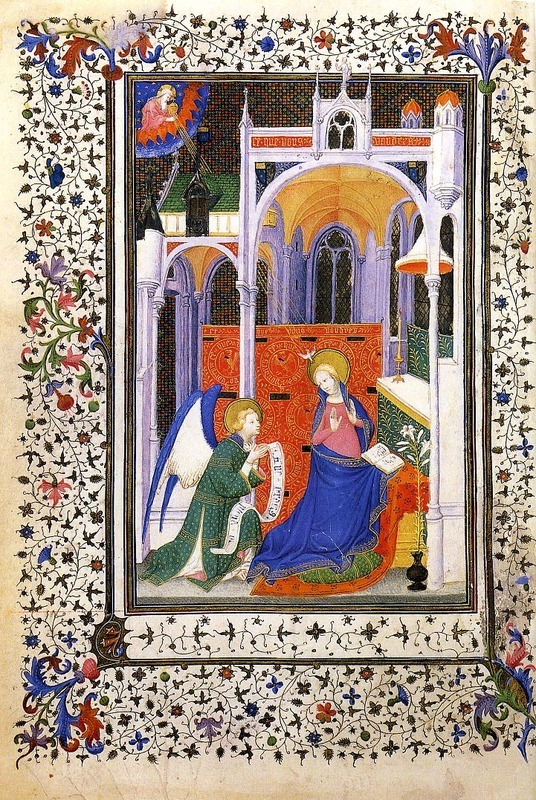 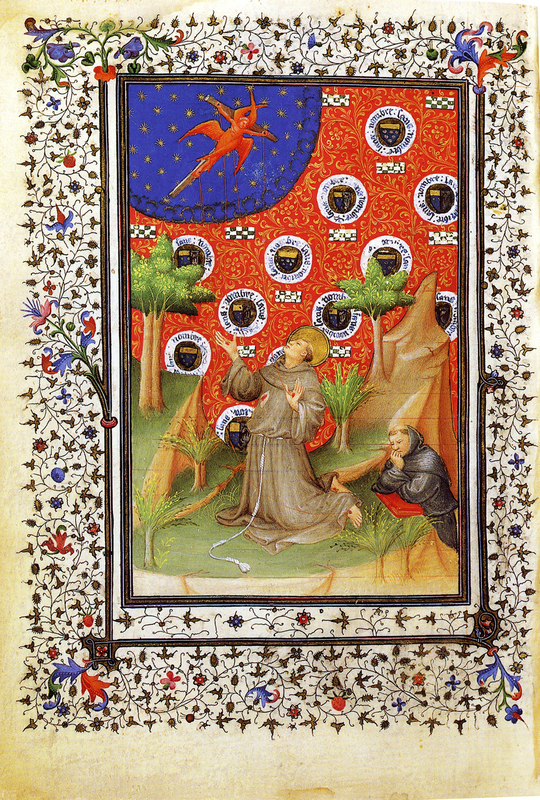 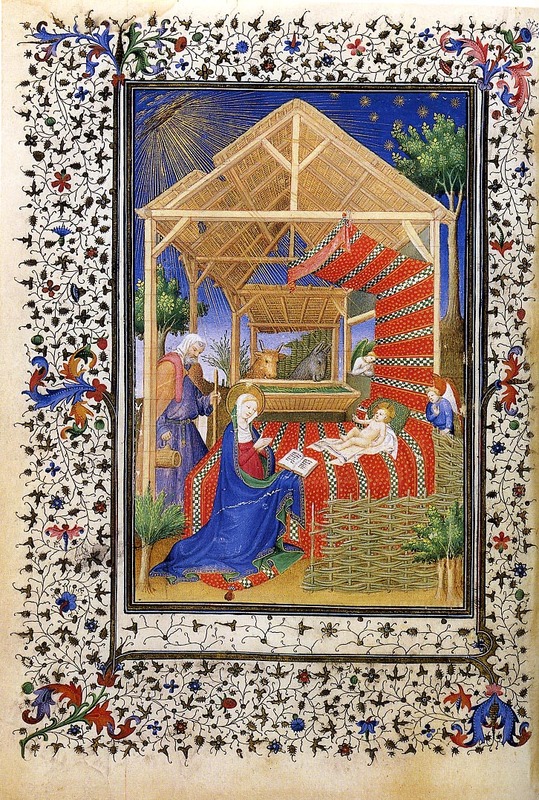 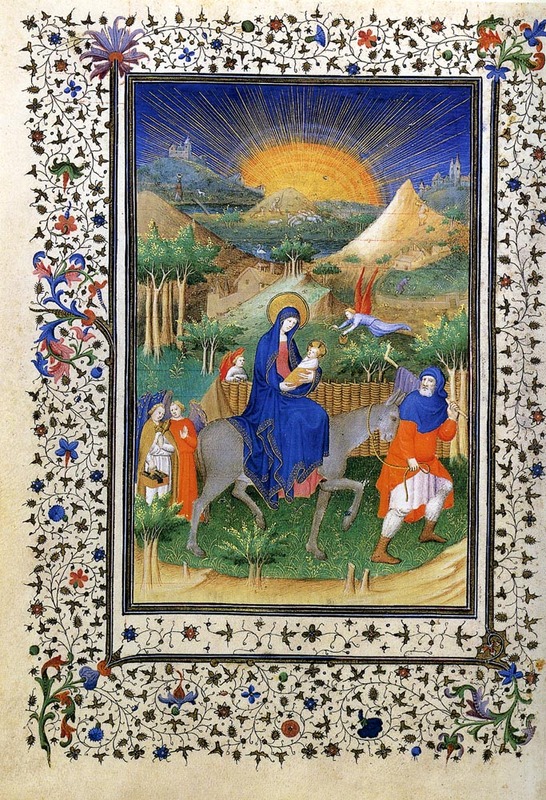 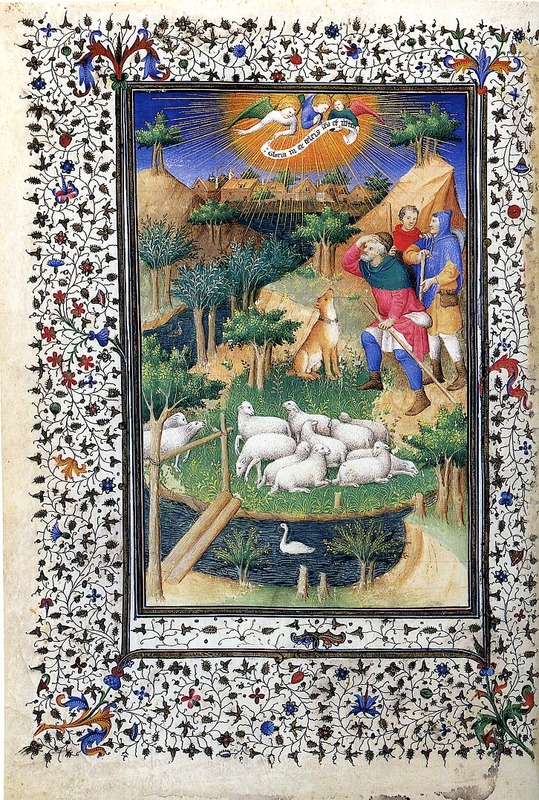 Study of the oeuvre of the illuminator would lead us to place the Boucicaut Hours about 1405.
p. 12: The miniatures in the Boucicaut Hours, all full page, are enclosed by borders of a generally uniform kind. 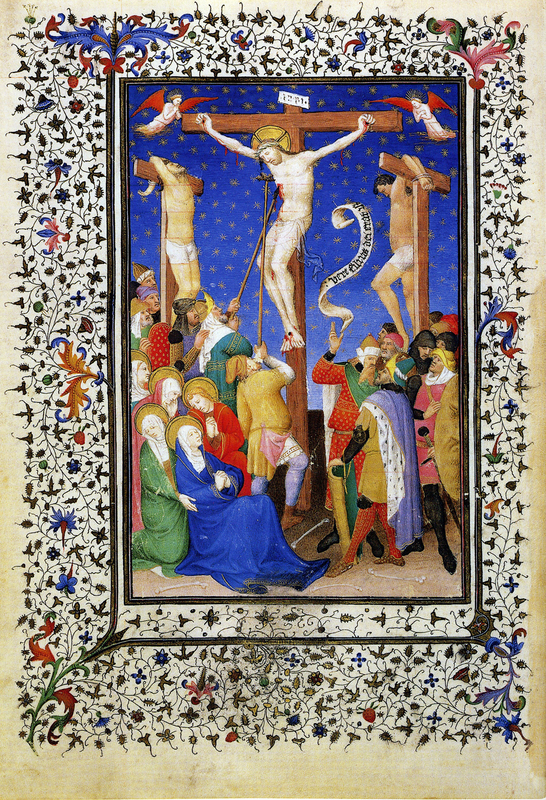 During the course of the execution the design of thse borders underwent no major change, such as occasionally occurred in the borders of large, richly illuminated manuscripts, the Grandes Heures for example. 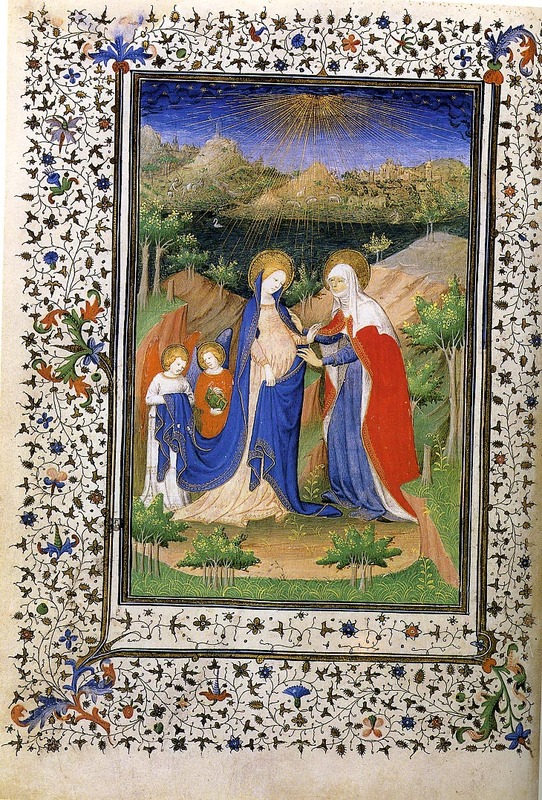 If we accept provisionally the date of circa 1405-1408 for the Boucicaut Hours the greatest novelty in the borders appears already on the folio bearing the very first miniature. At the four corners and at the center of the outer border the more or less long established formalized "ivy", gold "paramecia", an small flowers have given way to large leaves that, unlike the other elements, curl conspicuously into space. 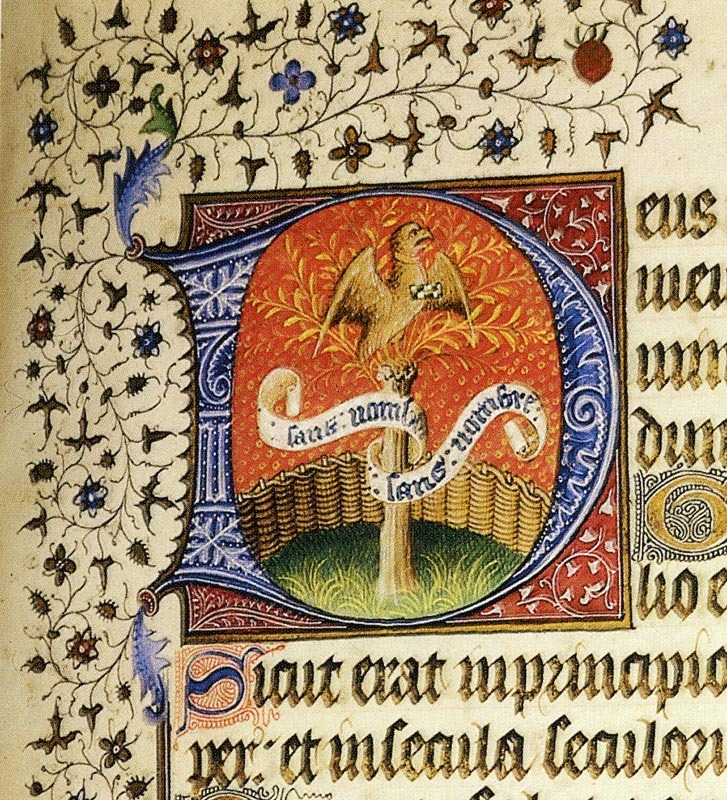 ...The Boucicaut Master might well have been influenced also by the closely related forms employed around 1400 to 1407 in Paris by the Master of the Brussels Initials. 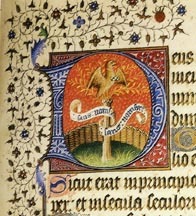 The Limbourgs and their circle adoped 'pseudo-acanthus' leaves of the kind for initials in 1405 and 1406. 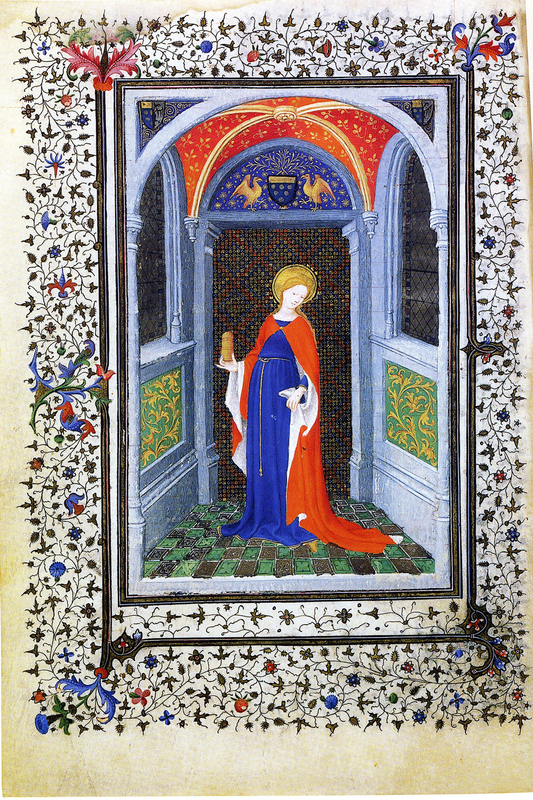 Konig, Bedford Hours, p. 26: Douce 144 is the earliest datable manuscript attributable to either the Boucicaut Master or the Mazarine Master.